The National Federation of the Blind of Georgia, South Fulton Chapter is sponsoring a fleet of National Federation of the Blind convention buses, which will sweep the southern region of the country picking up Federationists for the 2003 NFB national convention in Louisville, Kentucky. The buses will pick up in Atlanta/Decatur, Georgia, and Nashville, Tennessee. Soon to be added: Mississippi, Alabama, and Florida. Phase 1 registration runs from July 15 to November 15, 2002. A round-trip ticket to Louisville reserved during this period is only $25. Phase 2 registration runs from November 16, 2002, to May 15, 2003. A round-trip ticket to Louisville purchased during these months is only $35. For more information or to make reservations for the sweep bus in Tennessee, call Michael Seay, state president, at (901) 324‑7056. In Atlanta/Decatur call Stephanie Scott at (404) 759‑5513. In Florida contact Dwight Sayer at (407) 877-1970. Seats are limited, so reserve your seat today. President, Kevan Worley (Colorado); first vice president, Charles Allen (Kentucky); second vice president, Bob Ray (Iowa); secretary, Pam Schnurr (Indiana); and treasurer, Don Hudson (Colorado). Also reelected to the board were Don Morris (Maryland), Carl Jacobsen (New York), and Gary Grassman (New York). After many years of distinguished leadership, Joe Van Lent (Iowa) asked not to be returned to the board, so the division elected Stephanie Scott (Georgia) to fill that position. Elected to serve two-year terms were the following officers: president, Lisa Hall (Texas); vice president, Lois Montgomery (Illinois); secretary, Sherri Brun (Florida); and treasurer, Carol Clark (Kansas). The officers elected at the NABM business meeting were president, Linda Mentink (Wisconsin); first vice president, Deborah Brown (Maryland); second vice president, Karen McDonald (West Virginia); secretary, Cindy Ray (Iowa); and treasurer, Bee Hodgkiss (Minnesota). The NOSB officers elected on July 4 to serve two-year terms were president, Judy Sanders (Minnesota); first vice president, Ray McGeorge (Colorado); second vice president, Roy Hobley (Nebraska); secretary, Christine Hall (New Mexico); and treasurer, Paul Dressell (Ohio). The results of the NABRP election were as follows: president, Shawn Mayo (Minnesota); first vice president, Noel Nightingale (Washington); second vice president, Carlos Servan (Nebraska); secretary, Pam Allen (Louisiana); treasurer, Sheila Wright (Missouri); and board members Bryan Bashin (California), Tony Lewis (California), Lea Grupen (Hawaii), and Rosemary Lerdahl (Maryland). The newly elected officers and board members of the Diabetes Action Network are president, Ed Bryant (Missouri); first vice president, Eric Woods (Colorado); second vice president, Sandie Addy (Arizona); secretary, Lois Williams (Alabama); treasurer, Bruce Peters (Ohio); and board members Sally York (California), Paul Price (California), and Dawnell Cruze (Virginia). NOPBC board members elected were president, Barbara Cheadle (Maryland); first vice president, Carol Castellano (New Jersey); second vice president, Marty Greiser (Montana); secretary, Brunhilda Merk‑Adam (Michigan); treasurer, Sandy Taboada (Louisiana); and board members Carol Akers (Ohio), Nalida Besson (Massachusetts), Maria Jones (Kentucky), Barbara Matthews (California), Marla Palmer (Utah), and Brad Weatherd (Montana). The results of the election at this organizing meeting were as follows: president, Douglas Johnson (Washington); first vice president, Stephanie Scott (Georgia); second vice president, Junerose Killian (Connecticut); secretary, Antoinette Archie (Maryland); treasurer, Sheila Chastain‑Latham (Michigan); and board members Nola Baker‑Jones (Arizona), Debi Black (Arizona), Wayne High (Georgia), and Vickie Saucier (Louisiana). The division elected new officers for the period 2002 to 2004. They are Richard Edlund (Kansas), president; Burnell Brown (Washington, D.C.), first vice president; Robert Deaton (Nebraska), second vice president; Wendy Carter (Utah), recording secretary; Patricia Tuck (Florida), corresponding secretary; Kimberly Johnson (Colorado), treasurer; and Dana Ard (Idaho), Bruce Woodward (Connecticut), and Joseph Naulty (Florida), board members. Friday, July 5, 2002, interested Federationists wrote and adopted a constitution for this new division. Offices were discussed, elections held, and one of the NFB's newest divisions was established. The board, like the membership of the group, has a wide array of interests and a wide geographic distribution. Agroforestry, apiculture, and aquaculture; composting, gardening, and landscaping; firearms and hunting; dairies and milk products; ranching and riding; tack and tractors; vermiculture and zymurgy: we cover the map. Blind people are working, studying, and hobbying in every field, while feeding and clothing the world. Put your boots on, roll up your sleeves, and join us! Elected were Diane Starin (California), president; Liz Lewis (South Carolina), first vice president; Fred Chambers (California), second vice president; Melissa Smith (Missouri), treasurer; and Hayley Agers (Washington), secretary. At the conclusion of our business meeting members networked over a light dinner of local produce, baked goods, and beverages. Topics included naming a newsletter, choosing its editor, planning for next year's tours, and thinking about upcoming state affiliate conventions. The Field Post is our newsletter. Stories, suggestions, and questions can be submitted by e-mail to the editor, Fred Chambers, <regenerative@earthlink.net>. Churchill Downs rolled out the roses, welcoming our tour with grace and hospitality. We spoke to staff about their jobs, found our favorite spot from which to watch the races, thrilled at the thundering hooves and cheering crowds, and can hardly wait to return. Next year we'll run another Churchill Downs and Kentucky Derby Museum tour on Tour Day. For Seminar Day we are planning a trip to the Kentucky Horse Park, with a chance to ride. We will meet extension agents and AgrAbility Project staff to learn about grants aimed at blind or disabled people who want to start or continue careers in agriculture's myriad fields. Other stops will be an organic farm, a winery, and a bourbon distillery. Consult the Braille Monitor and join the Agriculture and Equestrian Division to keep posted. This year's national convention featured a variety of merchant endeavors. Our Randolph-Sheppard reception Sunday evening was attended by over two hundred. Again this year we were pleased to give away free Coke and Diet Coke all week at our table in the exhibit hall to help quench the thirsts of hot conventioneers. We broke fundraising records on Snack-Pack and raffle ticket sales. And our annual merchant meeting was packed with Federation merchants. The meeting featured an array of new ideas and business opportunities: everything from new ways of collecting on bad checks to a new partnership with the National Automatic Merchandising Association (NAMA). This year we presented lifetime membership awards to James Gashel and Joe and Lora Van Lent. Again this year Merchants President Kevan Worley provided an informative and inspiring account of the activities and accomplishments of our division. He concluded the report by saying: "My brothers and my sisters, I began this report by talking about a personal recollection of Dr. Jernigan. I believe he would be quite proud of this group. We have an ever growing commitment to our Federation, an ever expanding vision of what the Randolph-Sheppard Program can become. We are this country's blind vendors who care more than about the price of Pepsi. And again this year we have proven that we are willing to pay the price to protect and expand opportunities under Randolph-Sheppard, to share the cost of our commitment to the organized blind movement, and to reap the profit of our collective action." I arrived at the convention on Monday, July 1, 2002. Just a few hours after arriving I received a call from the director of our state agency serving the blind. He informed me that he needed our help with an emergency. On Friday afternoon, June 28, at 4:30 p.m., the Utah State Legislature received a plan and budget proposal to deal with the state's budgetary deficit. Part of that plan was a proposal to relocate the Division of Services for the Blind and Visually Impaired, together with our general rehab agency, to our state's Department of Workforce Services. As Federationists know, services to the blind suffer when buried deep within another large state agency--especially workforce services, where blind people would receive greatly diminished services and training. Because our state legislature was scheduled to act on this unfortunate proposal within one week (while we were still at the convention), we knew we had a problem. We needed to let the legislature know that the blind of Utah strongly opposed the plan to relocate our blindness agency to Workforce Services, yet there we were in Louisville, Kentucky. We immediately met with the almost eighty members of the NFB of Utah who were at the convention. We met each day right on the convention floor after the morning session to update each other and make new assignments. We decided to take action in three ways. First we called our fellow Federationists at home and alerted them to the problem. I asked them to attend the legislative hearings prior to our return home. Next we asked our agency director to fax us a copy of the names and telephone numbers of our entire legislature. Since we had Federationists from around the state with us, we were able to ensure that almost every member of the legislature received a call from one of us with the request that our agency not be relocated. Last of all we wrote a letter to members of the legislature. (We even used Whozit, our brand new logo.) This letter was drafted and reviewed by our members during lunch and after convention sessions. We then collected signatures from most of our members at convention. It was great! We had a powerful letter with more than sixty signatures. We sent the letter back to Utah, where it was distributed to every legislator. I am very happy to report that the proposal to relocate the agency serving the blind in Utah was defeated. Even though we were at our national convention, the members of the NFB of Utah manned the barricades and defeated a potentially tragic bill. It was truly an exciting way to spend extra time at the convention. 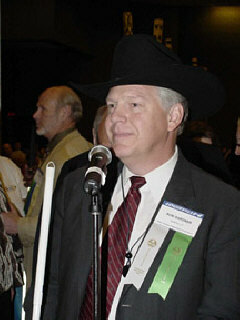 The National Association of Blind Office Professionals (NABOP), a Division of the National Federation of the Blind, held its 2002 meeting in Louisville on July 3. Among several interesting program items, Michael Barber of the Iowa Department for the Blind spoke to the division promoting and disseminating information about their ASSIST with Windows training tutorials available for purchase as well as a new grant training program called Microsoft Office User Specialist (MOUS) Certification, which offers online training to blind users as well as rehabilitation professionals in the use of Microsoft Office applications through keyboard commands with various screen readers. This latest grant is a five‑year program which will offer opportunities for blind people and rehabilitation professionals to learn online how to use many Microsoft Office products for MOUS certification. I wanted to let you know how much your efforts are appreciated by Spanish-speaking attendees at the national convention. This year we had three people from Maryland who took advantage of this wonderful service. I received a letter from one of them. I wanted to share a few of his comments with you: "Because of my experience at the NFB convention, I feel from the bottom of my heart and through my entire being that I am a different person. What one desires, one can achieve. It is only a question of putting one's effort into it." _____'s English is very limited. He would not have been able to understand and participate in the convention without your help. We certainly could not have provided what he needed. I wanted to make sure that you know that your efforts are definitely not in vain. ____ has already enrolled in English classes and seems determined to do something with his life. We have been trying to get him to a convention for some time. Fear got in his way until this year. Now he intends to come every year. Spanish translation makes a difference. Thanks again for your efforts. Over the decades that I have been attending NFB conventions I have noticed two gradual changes. More Braille is being used by convention goers and leaders alike. Some is being written in the old-fashioned way with slates or mechanical typewriters, and some is produced in the new-fashioned way by high-tech equipment. Either way it is Braille, and more than ever blind people are reading and writing for themselves. The other difference is that in the past, when I met people, I asked their names and where they were from. Then I had to be careful about asking what they did, that is, were they employed. We all wanted to be employed, but a lot of us weren't yet. Nowadays, the employment rate in the Federation is increasing to such an extent that I don't have to be careful about how I ask. I can just ask what kind of work people do. We have all heard that 85 percent of blind people who are employed use Braille, and I have concluded that believing in the Federation philosophy leads people toward independence such as reading for themselves in Braille and finding employment. Anyway, that is my observation. Technology and NFB literature weren't the only things on the exhibit hall floor at this year's NFB convention in Louisville. Crowds of attendees gathered around the booth of ZForm, a small company dedicated to creating completely accessible online games appealing to blind, low-vision, and fully sighted players alike. Attendees could play the company's first title, ZForm Poker, against either computer opponents or each other. ZForm's mission is to create fun and engaging ways for friends and family to interact as equals regardless of visual impairment. The game also includes the ability to chat with other players, which allows for the interaction that is the centerpiece of ZForm's mission. Players can choose from low-stakes social tables to high-roller, fast-paced tables. "We designed the game to appeal not only to the die-hard poker players out there but also to people who are more interested in sitting down for a casual game with friends," said Paul Silva, ZForm president and community director. Poker wouldn't be poker without the occasional grand tournament. ZForm held such tournaments throughout the week, in which players vied for free subscriptions to ZForm Poker and thousands of dollars in prizes generously donated by several sponsors. Dolphin Computer Access, IBM, Independent Living Aids, and Freedom Scientific all contributed to the success of the tournaments. ZForm also came armed with a thousand special ZForm Poker CD's made exclusively for the NFB convention, all of which were gobbled up by eager conventioneers. ZForm got its start in a college dorm room in 1997. "I had a friend who was totally blind," remembers Silva. "I wanted to hang out and play games with him, but there was just nothing out there that would be equally fun and playable by both of us." Co-founders Paul Silva and Jeremie Spitzer had a dream of starting a game company, and when they realized the need for these games, they formed their company with a mission to fulfill that need. "We were sure we weren't the only ones to come up against this social barrier," said Spitzer, "and we hoped that if we could break it down, the entire blind and visually impaired community could benefit." They spent the next three years recruiting the ZForm team and securing the funding needed to bring their vision to life. Their efforts culminated in the launch of ZForm Poker in April of this year. Everyone is invited to try ZForm Poker free for fifteen days. After that the game is available by subscription. The costs are $7.95 per month, or, for a limited time, $59.95 per year, a 37 percent discount. To sign up for the free trial and join the ZForm community, visit ZForm's Web site at <http://www.zform.com>.